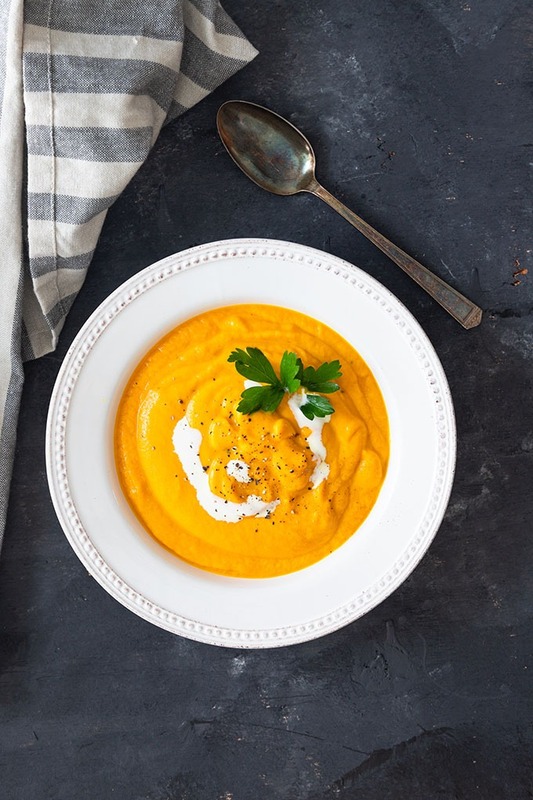 Carrot and Ginger Soup – a flu-fighting, creamy and cozy soup that is amazing for those cold fall nights by the fire! This soup is creamy, light, fresh and with a hint of ginger to keep the flu at bay! Served with crusty bread and a glass of vino, this soup is totally cold weather goals. Thank goodness it’s Wednesday already, I’ve been having just a ‘blah’ week this week. You know those weeks where you’re not really sure why, but everything just feels hard and crappy and all you want to do it curl up on the couch with your puppy and a hot chocolate? I think I’m just feeling super overwhelmed with the amount of work I’ve got going on at the moment and everything is just slowly starting to creep up and stress me out! But in other news, how on earth is it October already? Can you believe how quickly this year has gone? Only three months until the new year! The fall is coming down fast here in Portland, the days are getting colder and shorter and the fall leaves are starting to fall like crazy, and I freaking love it! I’ve said this before, America really knows how to do fall well! It’s just gorgeous. My parents are flying in from Australia next week so I can’t wait to take them around and do ‘fall activities’ – like apple picking, pumpkin picking, hayrides and corn mazes! It’s going to be amazing! They’re staying with us for 5 days, then we are driving up to Vancouver BC for a few days so they can check it out. I haven’t been to Vancouver in ages, so I am really excited to see the city again! But apart from apple picking, cider tasting and what not, what else should I do for fall? Is it wrong just to want to spend my days inside devouring soup and reading books? Probably, but one can dream! Speaking of soup, let’s chat about today’s recipe! I couldn’t believe that I actually only have three soup recipes on THCK! I feel like I make soup a lot in the colder weather, so I couldn’t believe that I only had three! Mind you, the three that are on THCK are amazing (have you tried my easy chicken pho yet!? ), but I still couldn’t get my head around the fact that there were so few recipes! So I decided that had to change, which means I am bringing you WAY more soups this fall and winter, so you better get used to it! 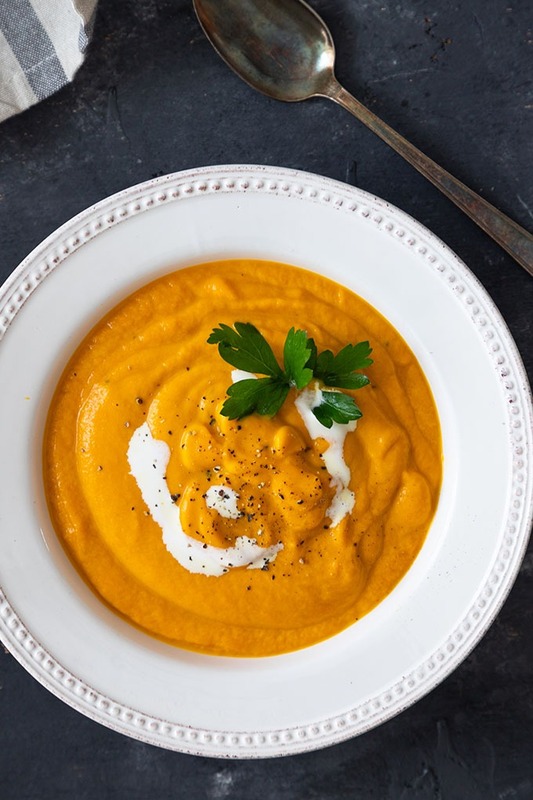 Starting with this gorgeous, creamy AF carrot and ginger soup with honey! This recipe was inspired by a ‘Books for Cook’s’ recipe that I found in one of Mum’s recipes books year ago! The recipe was SO SO delicious I just had to find a way to recreate it! Don’t be weirded out by the fact that this soup is solely made of carrots though! Carrot soup is actually amazing, even maybe as good as my pumpkin sweet potato soup! When blended up and with some ginger, honey and cream added, this soup is so creamy and comforting! And not to mention – healthy(ish)! 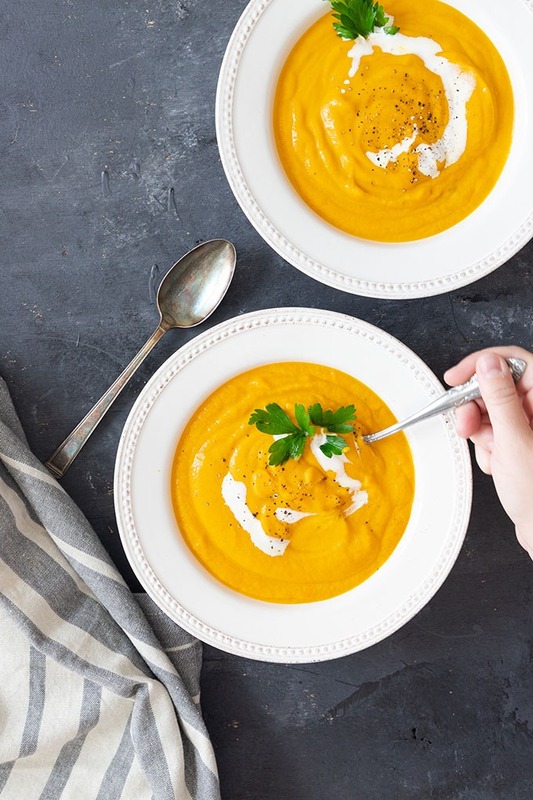 How to Make this Uber Cozy Carrot and Ginger Soup! 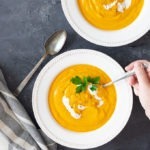 This carrot and ginger soup is very easy to make, really as simple as bunging some ingredients in a pot together then simmering it until the carrots are cooked and pulsing it with a blender. See, easy! Ok but really, this soup just requires a handful of simple ingredients found in the supermarket, one large pot, and one immersion blender or food processor. That’s it! 9 ingredients in total! Like my pumpkin soup, the method of cooking this carrot and ginger soup is by boiling the base ingredients (onion, carrots, ginger and veggie stock). Once they’ve simmered until they’re soft, you’ll want to use an immersion blender/stick blender to blend all the ingredients together. If you don’t have an immersion or stick blender then you can strain the liquid bit by bit into another saucepan or dutch oven, and then blitz the leftover puree in the sieve until it’s smooth. To finish off, add your honey and cream, and re-heat until it’s just boiling. This is best served with fresh parsley and crusty bread, and of course, a glass or two of vino for good measure! 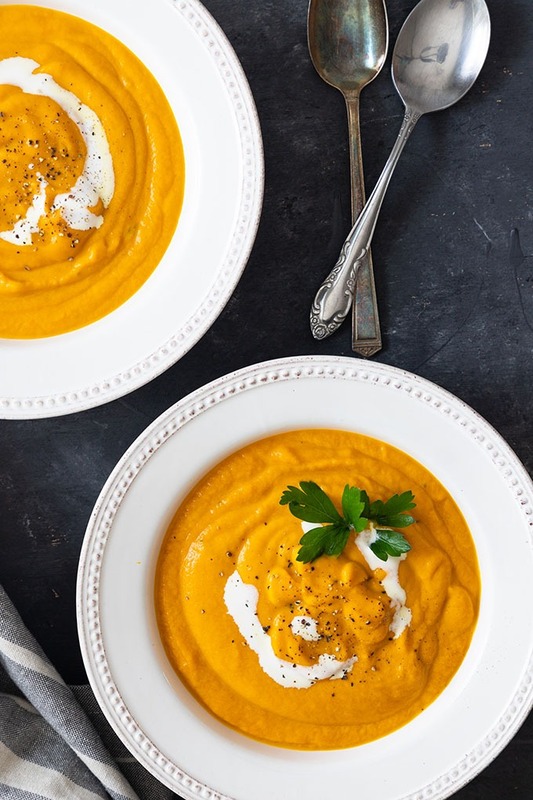 The perfect cozy soup for the fall, this carrot and ginger soup is creamy, healthy(ish) and so delicious to devour in front of the fire! Heat the butter and olive oil over medium to high heat until the butter melts. Add the onion, and fry it off for 5 minutes. Add carrots, and sweat for 5 minutes, stirring occasionally. Add the ginger and stock, and bring to the boil. Reduce heat and simmer covered for 30 minutes, or until the vegetables are soft. Blend with a stick/immersion blender until the soup is nice and smooth. Stir through the cream and honey. Place back on low to medium heat and gently heat until it's warm enough to serve. Serve with a garnish of parsley and fresh bread. thanks Rebecca, it’s so cozy and comforting! That soup looks delish! I love having soup and some crusty bread on a chilly evening. The soup looks really easy to prepare to which is always a plus on busy nights. It’s really easy, that’s what I love about it, especially if you already have an immersion blender! This soup is amazing! I love the flavors and how thick and hearty it is! it’s delicious, I love thick and creamy soups! I LOVE the carrot and ginger combo! Such a delicious combo for a soup! it’s so cozy and the hint of honey and ginger really make you feel good! I am currently fighting a cold and really wish I had this soup right about now. It looks wonderful and I love that drizzle of cream over the top. Cream makes everything better right!? hope you feel better soon! This soup looks so perfectly savory and creamy! Going on the list! thanks Kelly, it really is delicious! Amazing! This has been one simple soup to make! Tasty and enjoyable! I used water instead of broth because the carrots and onions release its flavors into the water after simmering it. I used a hand blender. Added a half a teaspoon of chili powder and tried it with cream. Tasted great! Thanks for the recipe!